We're pleased to announce the re-release of our Cherry Electric Bass sample library. We've updated Cherry to KONTAKT 4, combining all the articulations as well as two new articulations--muted fingered and muted picked--with an entirely new script and interface, employing the very latest features in KONTAKT 4. 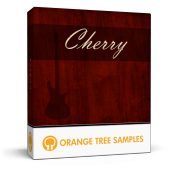 Cherry also features new dynamic samples, capturing the loudest velocities of bass playing.